Viewing 18 of 18 items. This beautiful hostess set includes 3 bars of soap and 12 disposable paper linen guest towels! 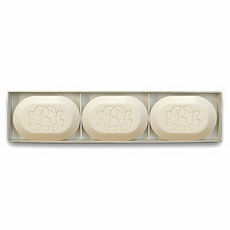 Our triple-milled, 100% vegetable-based warm white soaps which are manufactured and handcrafted in.. Enjoy our beautiful gift sets! Our triple-milled, 100% vegetable-based warm white soaps which are manufactured and handcrafted in New England. Each square bar is 4 ounces, individually addressed and.. Enjoy our beautiful gift sets! Our triple-milled, 100% vegetable-based warm white soaps which are manufactured and handcrafted in New England. Each Bar measures 2.5" x 2.5" x 1". Each..
Carved to your desire! 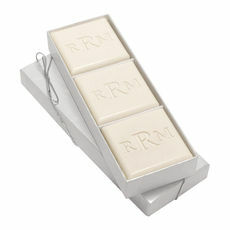 Refresh, rejuvenate, and spoil with only the finest fragrant, personalized soap deserving of your discerning taste. Each New England made bar is a generous 5 ounces, vegetable.. Enjoy our beautiful gift sets! Our triple-milled, 100% vegetable-based warm white soaps which are manufactured and handcrafted in Vermont. Each bar is generous 4.5 ounces, individually addressed and.. 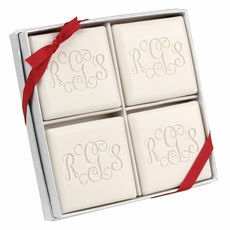 Enjoy our luxury soap gift set featuring four generous 4-oz square warm white soaps individually handcrafted and intricately carved with a block monogram. Middle initial will always be larger. ..
Refresh, rejuvenate, and spoil with only the finest personalized soap deserving of your discerning taste. 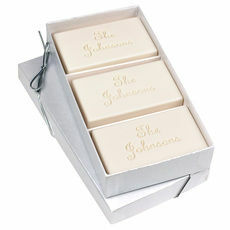 Our Signature Spa 6-Bar Collection is a gorgeous blend of today's most intriguing and..
A lovely present or for yourself. 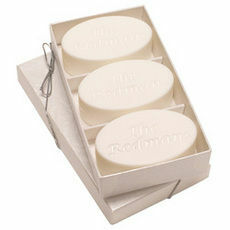 Enjoy our triple-milled, 100% vegetable-based warm white soaps which are manufactured and handcrafted in Vermont. 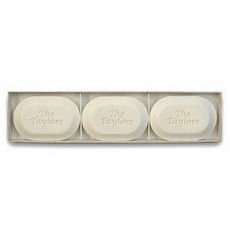 Each bar is a generous 5 ounces, individually..
Personalized soaps are an especially nice touch in any guest powder room for a sophisticated addition to your decor. Our beautiful selection of soaps can be intricately carved with names, initials or monograms to enhance your bathroom or to select as an elegant gift for friends or family members. A variety of fonts are available to match any style and provide a formal, feminine or contemporary look. Our soaps are vegetable based and are triple milled for purity and smoothness. They include only natural scents and ingredients. Our soaps are gentle for sensitive skin and paraben free. We also offer a variety of hypoallergenic soaps for extra-sensitive skin. Many beautiful, natural fragrances are available, including green tea, lavender, aqua mineral, verbena and other botanical delights. The look, feel and aroma of these soaps are sure to engage all your senses. 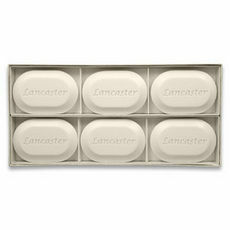 Our soaps are made in the United States and they arrive in a gift box. 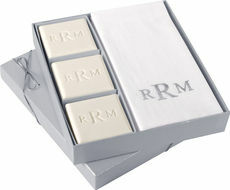 Hostess gifts are also available with gift boxes including both personalized soaps and towels. Our soaps are offered in rectangular, square, round and oval shapes. As a gift for yourself or for a friend, these beautiful soaps will add elegance and sophistication to your home decor. 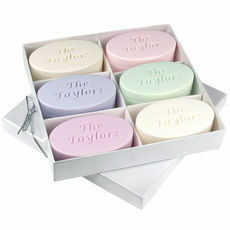 These beautiful, personalized soaps make a wonderful customized gift any time of the year. It's a fabulous gift idea for a bridal shower, hostess gift, or unique present for many other type of occasions. 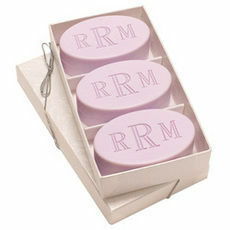 Personalized soaps are truly a luxury gift that will be admired and enjoyed. You are certain to impress your gift recipient with your discerning taste.